Weddings today carry a heavy importance on style, culture, traditions and luxury. Different parts of the day are designed in such a way as to share different parts of a bride and groom's life and influence into a celebration of their marriage. For these two whose reception was held at the historic Windsor Arms hotel they chose to take their formal wedding photos at Knox College found in the University of Toronto. This gothic revival architecture which was founded in the 1800s carries with it the most unique architectural details in U of T.
When we approach a wedding where the bride and groom have spent so much time crafting the look and feel of their wedding we try to create something truly unique for their photos. The bride who herself is also a photographer chose this spot as she was a student at U of T in her university days. 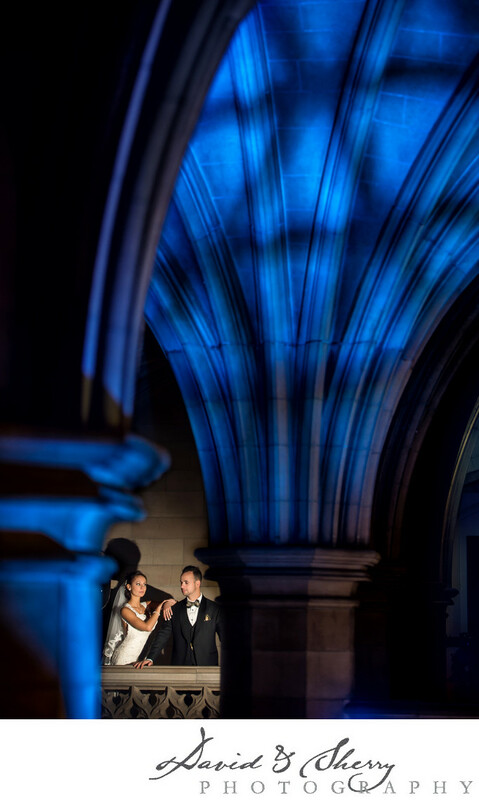 For this particular photo we set up two speedlight flashes, one with a gelled grid with a texture and color grid which we triggered into the gothic ceiling in the foreground, then had another flash on the couple with a warming gel and softbox to create a contrast of colors and texture in the image and create an image we are sure hasn't been done before at this location. Knox college requires the proper permits for a wedding day and can be found on the U of T Campus in Toronto.